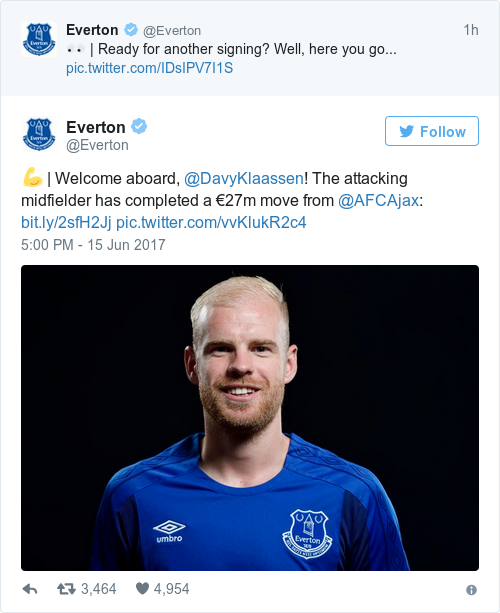 EVERTON HAVE COMPLETED the signing of Davy Klaassen from Ajax in a deal worth €27 million. The Netherlands international has signed a five-year deal with the Premier League side after passing his medical. Klaassen came through the ranks of the Ajax youth academy and made his official first-team debut in a Champions League encounter with Lyon in November 2011. He has since gone on to make 180 appearances in all competitions over the past six seasons, winning three Eredivisie titles in the process. The attacking midfielder, who was Ajax captain for the past two seasons, netted an impressive 20 goals in 50 appearances in all competitions in 2016-17 as Ajax finished runners-up in the Eredivisie and reached the Europa League final, where Manchester United proved to be too strong. Klaassen, 24, becomes Everton’s second signing ahead of the 2017-18 campaign, quickly following in the footsteps of Sunderland goalkeeper Jordan Pickford who also joined on Thursday. “I’ve walked around the training ground and talked with a few people and it feels good,” Klaassen told Everton’s official website. “I spoke a few weeks ago with Ronald Koeman about Everton. I wanted to come here and check if this was the right club for me and since I came here I feel so happy. It’s a great club. “The moment that I spoke with the manager directly I got a good feeling. He’s an honest guy, we talked about the club, about the way he wants to play and that gave me a positive feeling. Klaassen’s arrival bolsters Koeman’s squad at Goodison Park as they look to build on his first season at the helm, in which the Toffees placed seventh in the Premier League, and he is thrilled to have made two key signings in one day. “I’m delighted we’ve been able to bring Davy to Everton,” he said. “He’s a player who is only 24 but has a lot of experience and is a leader on the pitch. He has already captained Ajax for two seasons and that shows you the type of person he is. “He is hardworking, likes to press and, of course, will give us more creativity and goals. Email “Exodus continues from Ajax as big spenders Everton splash £27m on captain Davy Klaassen ”. 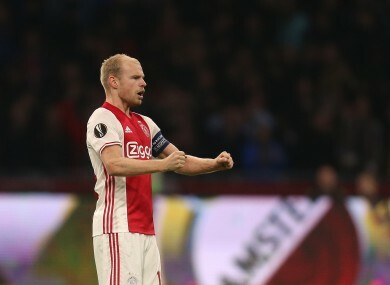 Feedback on “Exodus continues from Ajax as big spenders Everton splash £27m on captain Davy Klaassen ”.